Space Dogs, released in June 2012, is an exciting, animated tale based on the true story of Belka and Strelka, two dogs sent to space in 1960. Belka and Strelka are a circus dog and a rough-and-tumble stay who embark on an out-of-this-world adventure, humbly becoming the world's most famous canine cosmonauts. 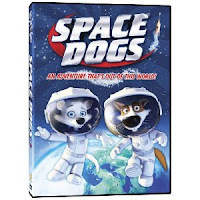 Space Dogs has an 88 minute run time and is rated G.
It included special DVD features including a slide show, trailer, and a fun downloadable activity kit. My son watching Space Dogs on his Sunday movie night! When we received this movie to review, it was the first one that caught my eye! My son loves dogs and I loved the storyline because it was based on a true story in history and I thought that was really cool! I also really liked that it was rated G for my young impressionable (and copycat!) son! Unfortunately, it still did have some words in the movie that I don't really like him using, but overall it was a cute movie and my son enjoyed it!